exclusive wall mounts for the thinnest TVs ever made. We have designed special OLED wall mounts specifically for OLED TVs. These screens are ultra-thin and therefore very fragile. Based on our many years of experience, Vogel's has specially designed full-motion OLED wall mounts for these TVs with a very smooth turning motion, preventing damage to the display. Here, you can find convenient full-motion OLED wall mounts and other wall mounts that allow you to mount your TV flat against the wall. Need some advice? Use the advice tool. Enter the brand and model number of your TV, along with the desired functionality, if applicable. We will then provide you with the best advice specifically for your OLED TV. You can also search without entering these details but if you enter the model number for your TV, we can give you more specific advice. A slim and elegant TV wall mount to mount your tv as flat as possible. An innovative TV wall mount with a striking design aimed to bring you the best viewing pleasure. 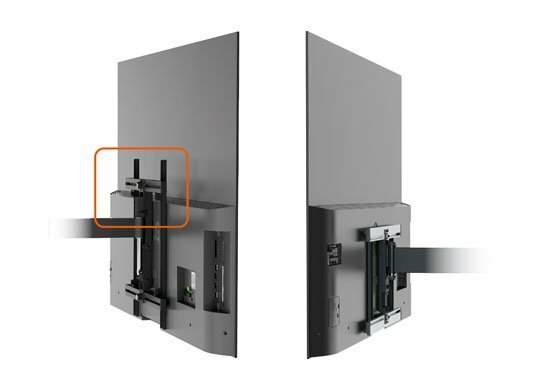 Why choose an OLED wall mount from Vogel's? the 'hole patterns' are usually positioned at the bottom of the TV. Our adapter is designed to fit seamlessly with the special pattern on the back of these TVs. This makes your OLED TV even more of an eye-catcher in your home.